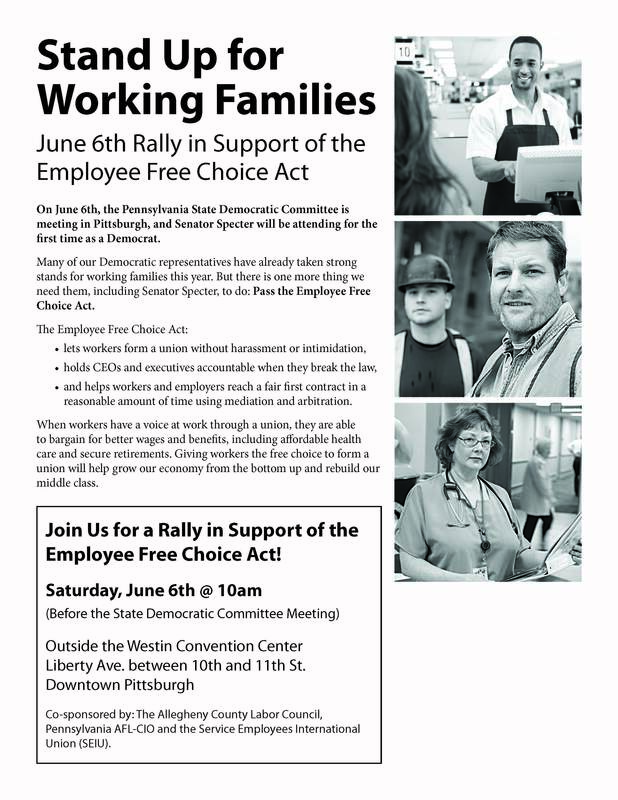 Please join us for a Rally in Support of the Employee Free Choice Act! On June 6th the Pennsylvania State Democratic Committee is meeting in Pittsburgh, and Senator Specter will be attending for the first time as a Democrat. Many of our Democratic representatives have already taken strong stands for working families this year. But there is one more thing we need them, including Senator Specter to do: Pass the Employee Free Choice Act. The Employee Free Choice Act will let workers form a union without harassment or intimidation; hold CEO’s and executives accountable when they break the law; and help workers and employers reach a fair first contract in a reasonable amount of time using mediation and arbitration. When workers have a voice at work through a union, they are able to bargain for better wages and benefits, including affordable health care and secure retirements. Giving workers the free choice to form a union will help grow our economy from the bottom up and rebuild our middle class. Come show your support! It’s important that our representatives in Washington see just how important this legislation is to Organized Labor. Lets build the crowd!